This morning I was up at 7 am, had my quiet time, fixed breakfast for the little wife, walked 8 miles, showered and dressed. I worked on some chapters for my books. I will be driving to Durant, Oklahoma, to preach for Pastor Winn. I am looking forward to being with these dear people. Today is our grandson R. G.’s 19 birthday! What a miracle child he is! On the day of his birth we opened our NATIONAL SOUL WINNING CLINIC with Dr. Jack Hyles the main speaker. On Tuesday night with out Dr. Hyles having knowledge of R. G.’s birth defects he announced the sermon, “Where Be All The Miracles?” He said in his introduction that he has never preached this sermon without finding out years later that a miracle occurred during the meeting. I believe R. G. is that miracle! He was not supposed to live let alone walk and talk. Yet here he is! I had this picture taken with him last night at the Bible study. 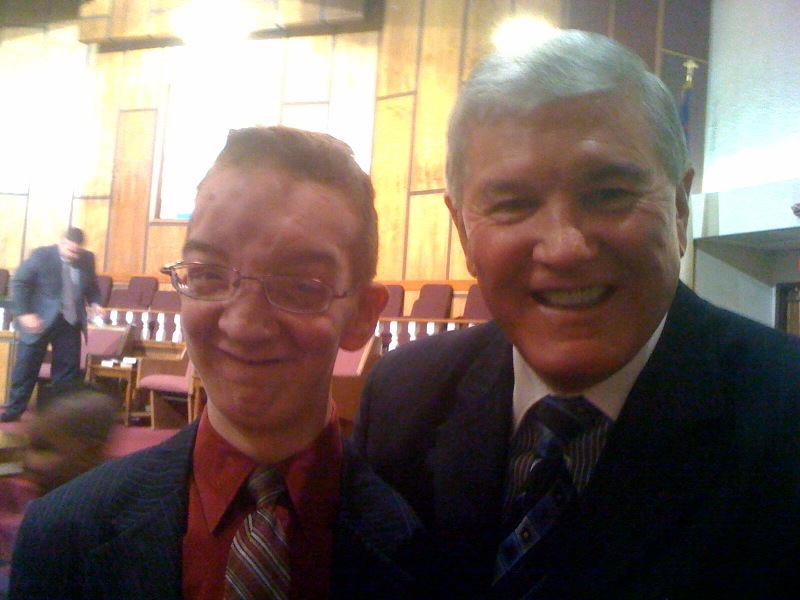 He sings in the LBT teen choir and does a great job. I watched him as he sat on the front row of church last night and took notes as best he could! He is a blessing! The truth is he thinks the whole world is abnormal and that he is the only normal person in the world! He probably is right! We love him! He always has a smile on his face, except when he has to go see a doctor and then he begins to act like his mother! Ha! Gotta love family!